'Whatever Happened To...' Those Hurricane Harvey Victims? NPR's John Burnett interviews Mel and Barbara Micah, who evacuated from Bellaire, Texas, which is southwest of Houston, on Monday. NPR has interviewed dozens of flood victims, and listeners are curious to know how they're doing now. NPR listeners are a compassionate bunch. All week they have been emailing to say they are anxious to know what happened to 19-year-old Jada Wilson in northeast Houston, who on Sunday told Michel Martin of being trapped with her family in her grandmother's home in waist-deep water, in the aftermath of Hurricane Harvey flooding. As Martin noted, listeners could hear the water, seemingly lapping around her, in the background. "Ever since I heard that, I have been on the verge of tears and waiting to hear if she and her family got rescued," Colorado listener Lara Duran wrote. "Please follow up on this family. I am very concerned. Please, if you are going to do a story on trapped people, please follow up." That's the power of radio, to create that intimacy between listeners and interview subjects. With that comes a certain responsibility, in my opinion. In this case, listeners need an update on how Wilson and her family fared. The weekend and weekday All Things Considered staffs are separate; the weekend crew passed Wilson's contact information on to the weekday staff. Christopher Turpin, NPR's vice president of news programming and operations, told me All Things Considered had indeed been trying to reach the family all week, without success. "We are as anxious as those listeners to track Jada and her family down," he wrote in an email, and said the show would update listeners if and when they do. "I'm a huge believer in following up on compelling individual stories at moments like this," Turpin wrote. "In the aftermath of Katrina it was folks we went back to time and time again"— people such as Randy Adams, whose last interview of nine total was in 2015, 10 years after he and his family fled the New Orleans hurricane — "who became like family to our listeners, who really helped us understand the arc of the tragedy." That said, Turpin wrote, "There have been a ton of compelling individual stories embedded in our coverage, each with a share of listeners wanting to know what happened." Realistically, he said, NPR can't follow up on them all. "We have to make choices." 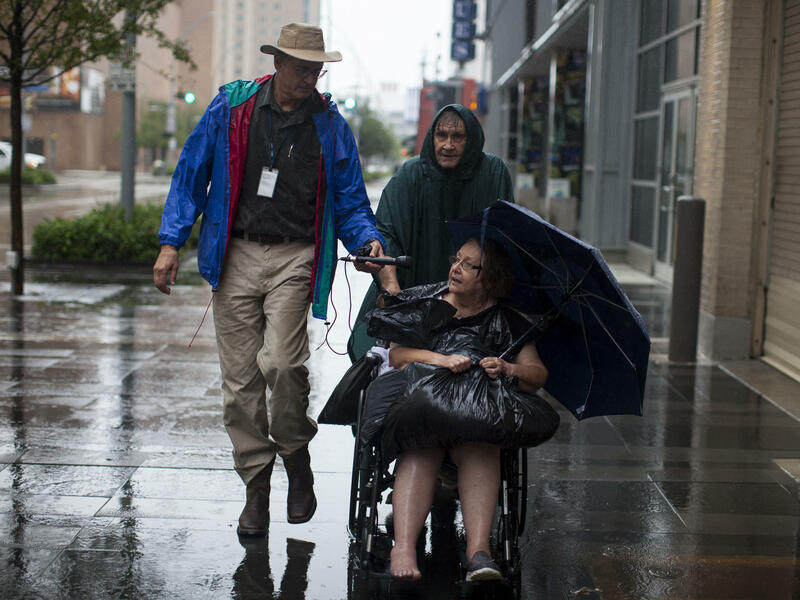 NPR has indeed told many personal stories in recent days, including those of flooding victims and rescuers, and it is currently soliciting even more. They have added a strong sense of the individual toll of the disaster to NPR's reporting on the link between the event and climate change, the region's preparedness, relief efforts, both official and private, and how the city is preparing to come back, among other topics. All the stories can be found here. Overall, I think NPR (and much of the media) could do a better job of following up on stories over time. So I was pleased to see a Goats and Soda blog series that started this week, with headlines riffing off "Whatever Happened To...."
The blog's editor, Marc Silver, told me, "It's certainly an old-fashioned conceit, but sometimes in the fast-paced world of the Internet we forget how valuable it can be to look back as well as looking ahead." First up was Michaeleen Doucleff's follow-up to an April story on a disfiguring lower limb disease in Uganda. The original story, Silver said, brought letters from readers "asking how they could help the farmers (who needed shoes to protect their feet)." Another half-dozen or so follow-up stories — each of the blog's correspondents was asked to choose one — will be rolled out over the next week. Readers themselves can suggest stories they would like to hear more about; there's a form soliciting input at the bottom of each installment in the series. "We all followed up on stories where interesting developments had taken place, so we learned a lot while we reported the follow-ups and we hope our audience is enlightened, as well," Silver added.